Alas, a week and a half before Charlie was due back at work it was time for us to head for home. Having done most of our packing the day before, it would seem that we would have little to do. But we still didn’t leave before noon. Those who never closed a residence for a Minnesota winter don’t know about draining water. Turn off the water supply, turn off the water heater, open all the faucets and then drain the water heater. You don’t want water in the pipes to freeze and burst. Leave the heaters on low to prevent freezing the pipes and put RV antifreeze in the drains (after all the power might fail and the house freeze). We said goodbye to Warroad a few minutes after noon and began our journey west. Roseau, Greenbush, Karlstad and then south at Donaldson as the construction/repair detour was still in effect (still unknown to OnStar and Waze). 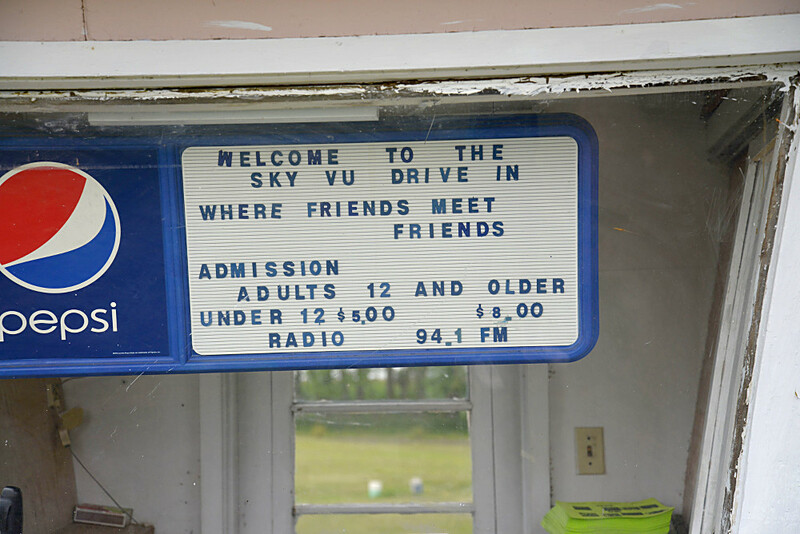 When we reached Warren we turned west once more and stopped at the Sky-Vu Drive-In Theatre. The current film showing was Tammy. 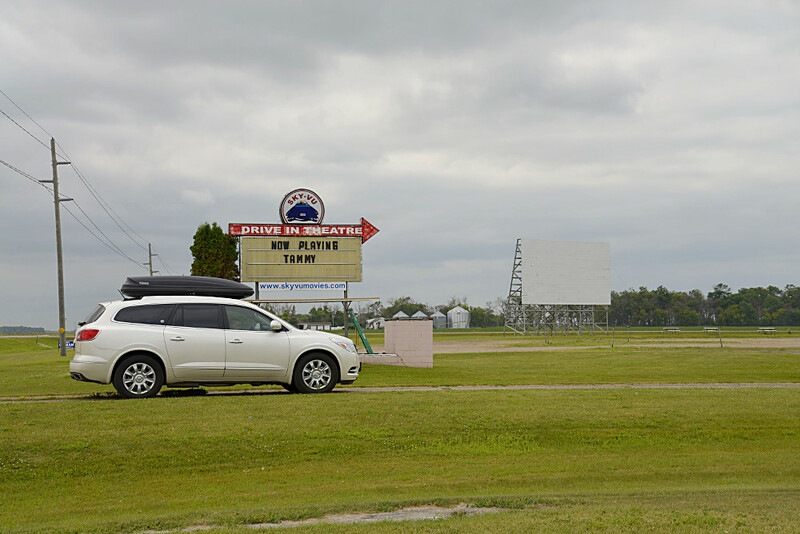 We stopped, took a few pictures and resumed our journey to Moorhead. Again we stayed at the Moorhead Travelodge, second floor smoking, cats. Nice room, good soundproofing as the motel is backed up to a busy rail line. The next day it was I-94 across North Dakota to Wibaux, Montana and the Beaver Creek Inn (same room we had before). This time Charlie went with me to have dinner at the Shamrock Club, excellent meal and great atmosphere. Of course, she had to buy a Shamrock Club hat as a souvenir. On to Bozeman, Montana and the Holiday Inn. This time the room was downstairs next to the back exit and it was a lot easier to move our luggage. Good room service dinner. This time we ordered three appetizers between us and no entrees, just the perfect amount of food. 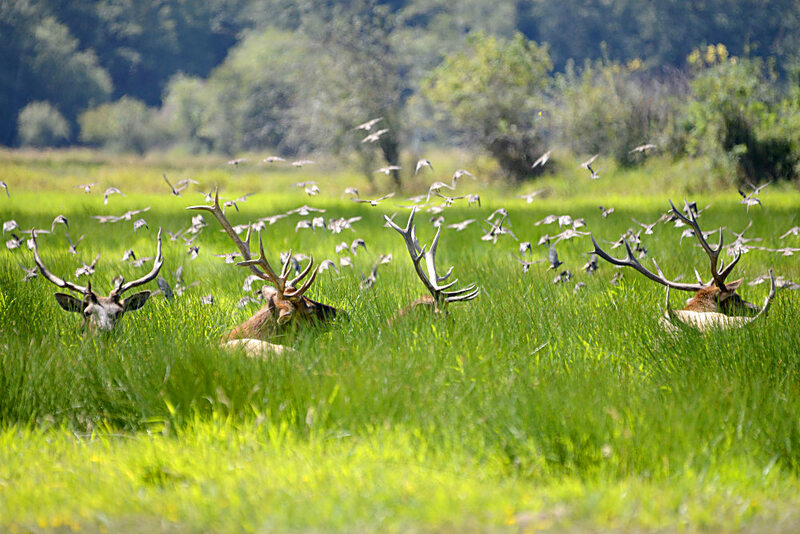 Elk at rest with birds. Stopped in Haugan, Montana at the Lincoln’s World Famous 50,000 Silver $ Bar for a break and souvenir shopping. Stayed the night at the West Spokane Super 8. They messed up our reservation for a smoking handicapped room and I ended up toting our luggage up to the third floor (dirty word, dirty word, dirty word). The next day it was south through Washington and then west along the Columbia River to Portland and south to Albany. A nice, easy day without too much Portland traffic. 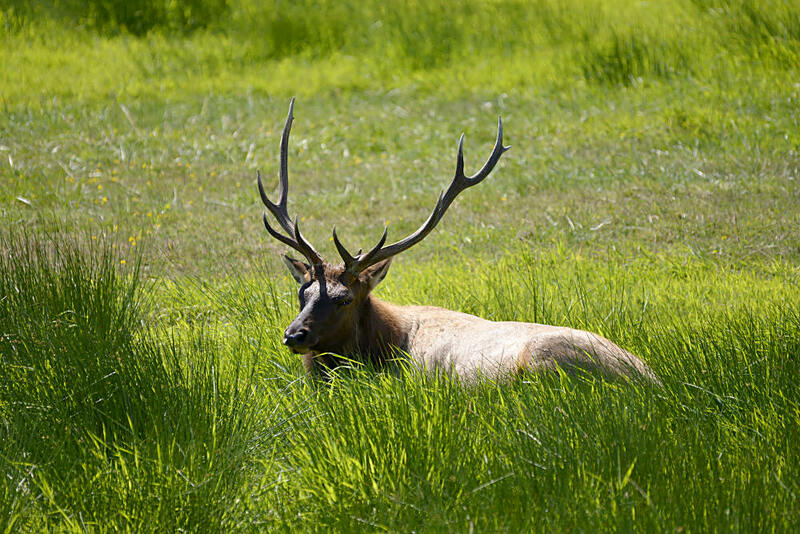 Our last motel day was south on the I-5 to the Umpqua River and viewing elk at Dean Creek, a stop at the Mill Casino for an hour of slots and shopping for Charlie and the on to Arcata. The Arcata Super 8 still had not correctly fixed the handicapped room shower, but, otherwise, the room was fine. for us (and I, of course, ate too much of her macaroni salad) and we had a good talk and rest. Saturday, it was south on the I-5 to L.A., with some stop and go traffic and home a little after six, a Subway sandwich for dinner and a sigh. It was good to be home. Three days to get the house organized and luggage unpacked and Charlie was back to work (and I embarked on my third year of retirement). Aside from the Super 8 screw-up in West Spokane the only negative about the trip home was the condom wrapper. At one of the motels, whose name I will not mention, Mist found an open condom wrapper under a bed missed by housekeeping. I mentioned this to the desk when I turned in our keys the next morning and they halved our bill. Quite nice; we’ve stayed there before and will again.